There are many Hampton pest control companies, but most deal with extermination of insects. We deal strictly with wild animals, such as raccoon, skunk, opossum, and more. Cornwell's Wildlife Control, LLC differs from the average Hampton exterminator business because we are licensed and insured experts, and deal only with animals. We are not merely trappers, but full-services nuisance wildlife control operators, offering advanced solutions. Hampton wildlife species include raccoons, opossums, squirrels, rats, skunks several species of snakes and bats, and more. Many animals can cause considerable damage to a house, not to mention contamination. We offer repairs of animal entry points and biohazard cleanup and we guarantee our work. Our Hampton rodent (rat and mouse) control is superior to other pest management companies. All of our wildlife trapping is done in a humane manner. Of course, we are properly Virginia state licensed. We are highly experienced in Hampton raccoon removal, squirrel removal, bat control, and more. We at Cornwell's Wildlife Control, LLC believe we are the best Hampton trappers of wildlife, and would be happy to serve your Hampton bat removal or pigeon and bird control needs with a professional solution. Skunks, moles, and other animals that can damage your lawn - we trap them all. 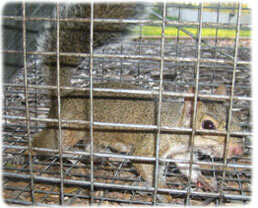 Our professional pest management of wildlife and animals can solve all of your Hampton critter removal needs. Our specialty is removal of animals in homes such as raccoons in the attic or squirrels in the attic. If you need Hampton pigeon control, Canada geese or other bird removal, we can help. We are experts with skunk problems, digging animals such as armadillos, & groundhogs, and we offer Virginia dead animal removal. We trap mice and voles. We do home repairs, animal prevention, and removal of critters from the attic, ceiling, basement, animal in the wall, and any part of a building. Give us a call at 757-690-7627 for a price quote and more information. 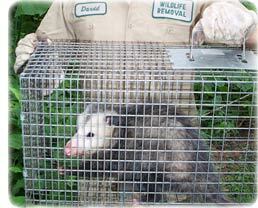 Remember, we at Cornwell's Wildlife Control, LLC run a wildlife removal company, and charge for our services. If you are searching for help with a dog or cat issue, you need to call your local Hampton County animal control or SPCA. They can assist you with problems such as a dangerous dog, stray cats, lost pets, etc. There is no free service in Hampton County that provides assistance with wild animals. Raccoons in ceiling - A raccoon found only in a ceiling is a very unusual scenario. Most of the time, if it's invaded the ceiling it's also invaded the attic. For the rare occurrence that leads you to having to remove a raccoon from your ceiling, your best bet is going to be to try to locate the litter of babies. This, of course, assuming the raccoon in your ceiling is a female as most of them are. Male raccoons tend to stay in the woods unless it is a very urban setting. The litter of kits will be hidden in the ceiling, and you'll have to find them by doing some detective work in the later hours of the day. Because a raccoon is predominantly nocturnal, you'll hear most of the noises sometime around dusk. Listen for the distinct chitter of the babies as they call out for food. This call will give you a good idea of where the nest is located. You can also tell the exact location by feeling around for heat. With six little bodies all curled up together, there will be a decent amount of warmth coming through the drywall. Once you've located them, you'll have to cut them out with a drywall tool. Try to avoid power tools; you don't want to injure any babies. Once you have the young kits, you can put them in a cage trap outside to lure in the mother. "("It's the same basic paperwork, but at the SPCA they made sure that we bonded with the rodent. They were concerned about the welfare of the animal," she declared. For additional information, call the animal services of Hampton, Virginia. "Here," she declared, gesturing at the wild animal Trapper store, "it's just a store clerk." Executives at the wild animal supply chain boast that additional than 2 million Wild critters and groundhogs or opossums have found homes through extermination centers located in each of their 750 stores. Though they may offer assistance with the cuddly wild critters, don't expect help with growling wild critters. The company partners with 2,700 different animal organizations nationwide to place homeless animals through the stores' in-house extermination centers. The centers may be typically run by a partnering agency. Animal and carcass elimination services in Hampton County is dedicated to helping Virginia and Hampton. And while AFRP Director Carie Broker declared she agrees measures should be taken to screen extermination applicants, her agency's volunteers cannot always be on hand at the Hampton store. Hampton County animal services in Hampton, Virginia, declined to make a statement on the matter. "People feel good when they come in here," The female animal officer declared. "They want to adopt and volunteer." Wildlife Management declared the Hampton County regional wildlife habitat, which serves over 7,000 animals each year, has always had the highest extermination rate among the county wildlife habitats, and that The female animal officer expects the numbers to increase. The female animal officer hopes the new wildlife containment unit will also help the county meet its goal of ending euthanasia of adoptable animals. Wildlife habitat staff estimated that there may be 50 wild critters and baby squirrels and 70 canines now available for extermination. If you need Hampton raccoon removal, rat trapping, squirrel removal, or have any questions about a wildlife problem in Hampton, please give Cornwell's Wildlife Control, LLC a call at 757-690-7627, and we will listen to your problem, give you a price quote, and schedule an appointment, usually same day or next day, to solve the problem.